One of our most popular tours, this extended tour showcases the unique and amazing colours of Uluru and Kata Tjuta at your choice of either sunrise or sunset. The unique flight path over the Red Centre will be sure to give you the opportunity to capture that postcard photo. Be sure to book in early as limited seats apply. 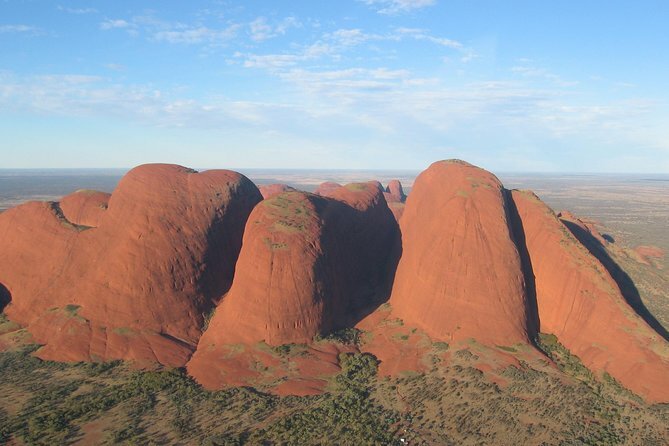 This scenic flight showcases Kata Tjuta, which in local Aboriginal language means 'many heads'. Kata Tjuta consists of 36 conglomerate rock domes, the highest of which stands at 198-meters - taller than Uluru! The domes are so widely spread and coupled with the restrictions due to sacred sites, access from the ground is restricted to over 75% of Kata Tjuta. However, there are no restrictions from the air. Your pilot will take you on a journey down the western face of Kata Tjuta, giving you the opportunity to get an iconic postcard photograph of the two features; Kata Tjuta and Uluru in the one shot. Seeing these two national icons, rest assured you will be left with cherished memories and photographs that will last you a lifetime. It really worthy to capture de dimension and beauty of Kata Tjuta and Uluru from the top. We were lucky because we got an helicopter only for my wife and me, a kind of unexpected private tour. Spectacular view of Uluru and Kata Tjuta from above and the only way to get that view is in the air. Worth every cent. You get views that you just can't appreciate from the ground. Staff and pilot all very friendly and informative. Cannot fault in any way. Good trip opportunity to see Kata Tjuta without driving to it also great photos of Uluru.Only draw back was it seats 4 across the back so 2 people in middle have somewhat disappointing views.Also advertising shows helicopters with bubble for better viewing and although they did have those they sat on ground while we took another that did not offer the bubble same company.